O Blessed Apostle, St. Paul, greatest of all converts, who labored unceasingly for the conversion of other souls, inspire me with the ardor of your zeal that I may pray and work for the conversion of my brethren, redeemed in the Blood of Christ but not as yet blessed with the full light of His Truth. Mindful of the loving concern of the Divine Shepherd for the salvation of the “other sheep that are not of this fold,” I now beg your intercession to obtain the grace of conversion for (name of family member, friend or others). May God, the Holy Spirit from Whom alone this gift can come, hear my humble prayer and thus enable me to share with others the riches of my heritage of faith through Jesus Christ, Our Lord. Amen. 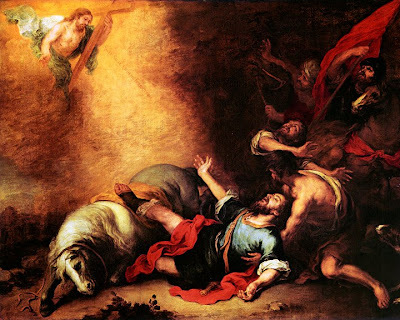 I would be really very glad and thankfull if you could tell me what is this picture with the Convertion of st.Paul? Who is the owner? Where I could ask for a better foto to have the possibility to look at it beter.